We are already at end of 2018, and if we talk about security, then it will be good to hope that we will get a bit wiser, too. According to a new survey, the 2018’s most common passwords will shock you. Hence, at the level of computer security, the requirement has to increase, simply to ensure “the best security”, but users do not always do so. Recently, a well-known software company, of course, SplashData has released its top 100 worst passwords list in which still the well-known password “123456” continues to maintain its position at first, but what about others, let’s know and explore the rest. According to the current security reports, the maximum number of internet users are still continuing to use “weak passwords”, which simply easily facilitates the work of hackers or cybercriminals to expose your data. As usual every year, the well-known software company, of course, I am talking about none other than SplashData who has just released its top 100 worst passwords and curiously the top 10 is almost the same as other years. Basically, these top worst passwords are based on leaks of over 5 million passwords. As mentioned, the password “123456” remains strong in the first position. 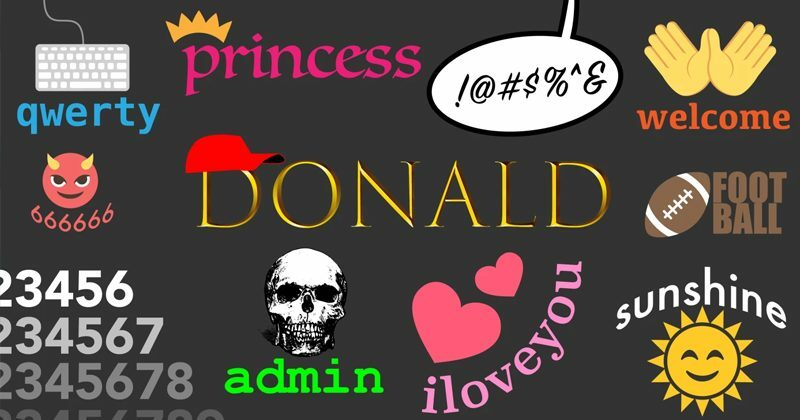 But, this year the highlight is the password “111111” that enters the top 10 and the password “donald” that came to appear in the top 25 which is probably inspired by the name of the current American President. However, if you want to see the list of top 100 passwords, simply click here https://www.teamsid.com/splashdatas-top-100-worst-passwords-of-2018/to explore the list. In the world of the internet, the security of your data is very vital. As nowadays there are many services for almost everything, there is a lot of information that we are “sharing” and we rarely know the level of security of these services. These are the tips that you should keep in your mind while making a selection of passwords. So, what do you think about this? Simply share all your views and thoughts in the comment box below.